1. Gather the yarn in whatever color you want your rug to be. It’s helpful to get different sizes and textures. 2. 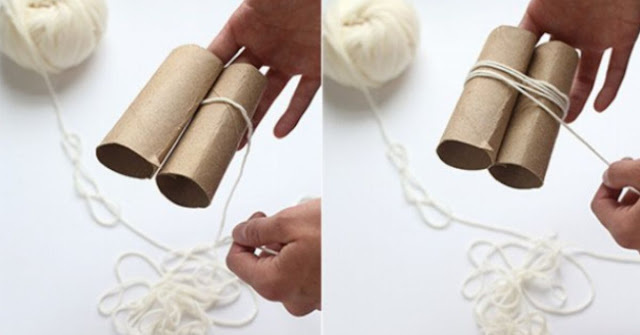 Take two empty toilet paper rolls, hold them next to one another and wrap the yarn around both. The rolls should naturally flatten on their own. 3. Cut the yarn when it’s about as thick as in the photo. To make sure it stays put, take another piece of yarn and place it between the rolls, pull tightly and then knot it. Next, you can carefully remove the paper rolls, you won’t need them anymore. 4. Cut the yarn on the side with a sharp pair of scissors. You should now have a tiny ball of yarn that looks like a tiny hedgehog. 5. Take the rest of the yarn that you used to form the knot and secure it to the rug pad. 6. Repeat the steps until you have the rug of your dreams. You’ll be the envy of your friends with this unique DIY rug – a true original. It’s so easy to make a place all your own; all you need is a little creativity and patience.